Last revised 8 February 2008. Other than the inherent risks of space flight, the radiation environment poses the most significant health and safety hazard to lunar operations. Because the Moon orbits well outside the Earth's protective magnetosphere and has neither an appreciable magnetic field nor atmosphere of its own, the lunar surface is fully exposed to galactic cosmic rays and to infrequent, but more dangerous, Solar Energetic Particle (SEP) events*. Fuller discussion can be found in the references below. Beginning with Apollo 8 in December 1968, nine Apollo crews flew to the Moon. Their missions provide us with data about the radiation environments encountered during varous mission stages: (1) the journeys to and from the Moon, (2) in lunar orbit, and (3) on the surface. Fortunately, no large SEPs occurred during any of the missions. The primary data set comes from the Personal Radiation Dosimeters (PRDs) worn inside the astronaut suits; and is supplemented by data from passive dosimeters carried on some missions, from instrumentation in the Command Module, and from data available from various oribtal platforms and from studies of lunar rock samples returned to Earth. As summarized by Bailey, crew-averaged skin doses received during the nine Apollo lunar missions ranged from 0.16 rads on Apollo 8 to 1.14 rads on Apollo 14. The average over the nine missions was 0.46 rads. The majority of each dose was due to passage through the Van Allen radiation belts. None of the crews received doses exceeding recommended maximum annual doses for people who work regularly with radiation sources. While outside the radiation belts, the radiation encountered was predominantly in the form of galactic cosmic rays. Dose rates experienced during the translunar and transearth phases of the missions ranged from 1 to 3 millirad/hr. In lunar orbit and on the surface, where the bulk of the Moon provides about 30 percent and 50 percent shielding, respectively, dose rates ranged from 1 to 2 millirad per hour. No large SEP events occurred during the Apollo missions. A large event could incapacitate an unprotected crew or even be life-threatening. SEPs large enough to put crew survival in doubt can occur up to a few times per solar cycle, but with considerable variability from cycle to cycle. During Solar Cycle 20 (1964-1976), there was only one large enough to threaten an unprotected crew and, fortunately, that event occurred on 4 August 1972, about midway thru the eight-month interval between Apollo 16 and 17. The authors of NCRP Report No. 98 (page 48) estimate that a crew on the lunar surface at the time of the event would have received a skin dose of 600 rem and a dose to the blood-forming organs of 130 rem. During planning for Apollo, a determination was made that the risk of losing a crew because of a major SEP was less than the other risks of such pioneering missions. During long-duration operations at a lunar base, personnel must be provided with adequate shielding from GCRs and access to shelter from SEPs to reduce doses to levels consistent with other risks inherent to spaceflight and lunar operations. Shielding and shelter can help ensure that experienced personnel don't have to retire from spaceflight prematurely. Bailey, J.V., Chapter 3, "Radiation Protection and Instrumentation", in Biomedical Results of Apollo, NASA Report SP-368, 1975. National Council on Radiation Protection and Mesaurement, Guidance on Radiation Received in Space Activities, NCRP Report No. 98, 1989. Reedy, R.C., Section 3.11, "Ionizing Radiation", in Lunar Sourcebook, G.H. Heiken, D.T. Vaniman, B.M. French (eds), Cambridge University Press, 1991. 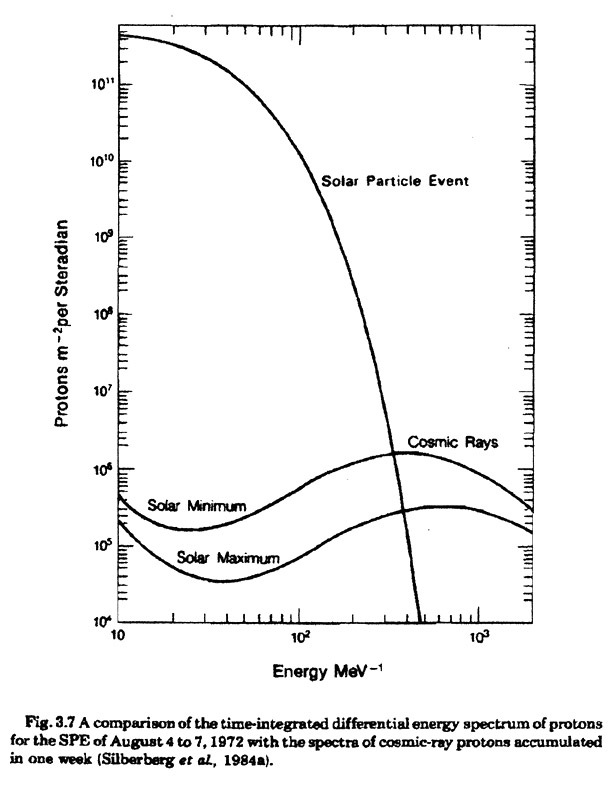 Reedy, R.C.."Constraints on Solar Particle Events from Comparison of Recent Events and Million-Year Averages, 1996. Simonsen, L.C. and Nealy, J.E., Radiation Protection for Human Missions to the Moon and Mars, NASA Technical Paper 3079, 1991. PRD readouts provided by the crews to Houston can be used to derive crew-averaged doses measured during the outbound and inbound passages through the Van Allen radiation belts and during other phases of the missions. The following table of PRD readouts is taken from the raw Technical Air-to-Ground Voice Transcription prepared after each mission. The PRDs were stowed in pockets inside the suits and were not always accessible. In some cases, a PRD would fail or give readings significantly different to the other two on the flight. In these instances, the readings are not listed. Prior to a mission, the three dosimeters were set to read "NN000", where NN is a two-digit number which was usually unique to that dosimeter. The remaining digits showed the accumulated dose in units of 0.01 rads. As an example, the first readout from Commander Tom Stafford's PRD on Apollo 10 was 26029, indicating a dose of 0.29 rads. SP-368, Biomedical Results of Apollo, gives a mission average skin dose of 0.16 rad. No PRD readouts in the transcripts. There is an indication in the mission transcript that Houston did get readouts, presumably via the same non-public, voice tape telemetry channel described in page 98 in Andrew Chaikin's "A Man on the Moon". Translunar Coast (TLC), first readout after belt passage. Devices in the CM provided telemetry during belt passage showing maximum skin dosage of 3.63 rad/hr during the outbound passage and 0.21 in-bound. Mission Report says average mission dose was 0.47 rad. Bailey gives 0.48 rad. The A12 Mission Report give uncorrected final readings of 0.25, 0.26, and 0.28 rads.These values are consistent with an extrapolation from readings prior to Belt passage, indicating that doses received during both belt passages were low. Telemetry from a seperate Van Allen Belt dosimeter in the Command Module indicated a total, integrated skin dosage of 0.11 rad. Bailey gives a mission average of 0.18 rads. Mission report (uncorrected), 0.69, 0.63, 0.64 rad. Return trajectory had long traverse thru the belts. The Van Allen belt dosimeter gave a skin dose of 0.97 rad, perhaps indicating that the PRDs were stowed in such a way that they were better shielded than expected. Bailey gives 0.58 rad. Mission Report (uncorrected), 0.29, 0.41, 0.34. Bailey gives 0.24 rad. The CMP's PRD wasn't in his suit after 23 hours, so not as well shielded as the other two. Lunar Orbit, LMP Ed Mitchell's PRD is now inoperative. Houston wants him to take CMP Stu Roosa's PRD down to the lunar surface. Lunar Surface. Ed mis-read Stu's PRD (or Stu had been misreading it). Mission Report gives 0.64 and 0.63. Bailey gives 1.14 rad. Largest in Apollo due to high doses during belt passages. Lunar Orbit. Commader David Scott PRD is clearly not working. He takes CMP Al Worden's down to the surface. Lunar Surface. Scott misreads the PRD but gives Houston a correction 15 minutes later. TEC. Houston wants CMP Worden to use the "25" PRD during his EVA to retrieve film from the Service Module and LMP Irwin to use "08" while standing in the hatch to monitor Worden. Irwin confirms the "08037" reading. Mission Report (uncorrected) 0.36 and 0.51. Passive dosimeters worn by all three averaged 0.30 rads at skin depth. Bailey gives 0.30 rad. TLC. The LMP's PRD has much higher readings than the others. Mission Report. Total absorbed dose about 0.5 rad at skin depth. Bailey gives 0.51 rad. First mission with 3 minor solar flares. No measureable increase in dose from those. TLC, LMP's PRD reads much higher than the other two "due to atypical performance ... at low dose rates". Mission Report: total absorbed skin dose slightly less than 0.6 rad. Bailey gives 0.55 rad. In the context of Apollo, most of the total radiation doses on each mission occurred during passage through the radiation belts. This component must be separated out in order to understand the radiation environment outside the Earth's magnetosphere, which is most relevant to long-term lunar operations. The Earth's magnetic field is strong enough to trap energetic particles arriving at Earth from solar flares and storms. Because of the shape of the Earth's magnetic field, the trapped particles are concentrated most strongly near the magnetic equator. An inner belt extends from an altitude of about 700 km to about 10,000 km (1.5 earth radii). This belt has a high concentration of high-energy protons. An outer belt is dominated by high-energy electrons. It is most dense at about 4 to 5 earth radii and extends no farther than about 10 earth radii. Because of differences in the trajectories flown from mission to mission, doses received by the crews during belt passages also varied from mission to mission. Actual doses received during belt passages depended critically on details of the mission trajectory relative to the most intense parts of the belts and the length of time spent in the belts. In all cases, the crews were beyond the belts within about ten hours of launch and did not enter them again until some time in the last ten hours before spashdown. For each mission, the following table lists the first crew-average PRD readout available from outside the Van Allen belts, the last before entering the belts on the way home, the time and dose differences, and the implied average dose rate while outside the belts. Although the first and last readouts are indicative of the doses received during belt passages, not all the time prior to the first readout and after the last readout was spent in the belts. The estimated average dose rate experienced outside the belts can be used to estimate the doses that would have been received prior to the first readout and after the last readout had the belts not existed. These can then be subtracted from the first readout and from the difference between the last readout and the post-mission total dose to calculate the doses received during passages of the belts. At the time of this writing, the absense in published sources of post-splashdown PRD readings for Apollo 10, 16, and 17 make it impossible to calculate an inbound belt doses for those missions. Note, also, that the post-mission PRD readings indicated in the Apollo 14 Mission Report are not consistent with the total dose of 1.14 rad given by Bailey. With regard to the dose rates estimated for time spent outside the belts, Bailey indicates that the expected radiation dose from galactic cosmic ray outside the magnetosphere at solar maximum is about 1.0 millirad per hour. During solar minimum, when the calm Sun is less effective in excluding galactic cosmic ray from the inner solar system, dose rates would be about 2 millirad per hour. The Apollo missions were all flown during Solar Cycle 20. The cycle began in 1964, was at or near maximum from 1967 until mid-1970, and then decreased to its closing minimum in 1976. Figure 3.16 in the Lunar Sourcebook indicates that, when Apollo 16 and 17 were flown in 1972, smoothed sunspot numbers were about half their value at the Cycle 20 peak, which is consistent with the larger dose rates experienced outside the belts on those two missions. On the lunar surface, about half the universe is block from view, so the expected dose from galactic cosmic rays is about 0.5 millrad per hour at solar maximum and 1.0 millrad per hour at solar minimum. In lunar orbit, at the 100 km altitude generally used during Apollo, the Moon only blocks out about 34 percent of the sky, so the expected dose is about 0.7 millirad per hour at solar maximum and 1.4 millirad per hour at solar minimum. Data from the Apollo PRDs can be used to estimate dose rates during the various mission phases. As with the previous table, rates are estimated from first and last PRD readings during a particular mission phase. Difference between TLC and TEC dose rates indicate the level of variability and/or measurement uncertainty. Not surprisingly, the last three missions, during which the Command Module was in lunar orbit for roughly 6 days and the Lunar Module was on the surface for roughly three days, provide the best data. The Apollo 17 data is probably the most reliable because there was always at least one functioning PRD in each spacecraft and the crew was conscientious about providing regular readouts. For that mission, the ratio of lunar orbit and lunar surface rates to the average of the TLC and TEC rates are 0.67 and 0.56, respectively, and are virtually the same as the expected ratios, which are 0.66 and 0.5, respectively. The dose rates in this table refer to absorbed skin doses. Medical risks are more properly assessed from "dose equivalents", with the relationship between absorbed dose and dose equivalent depending on the type of high-energy particles (protons, electrons, heavy ions, neutrons, x-rays, gamma rays, etc. ), the energy spectrum, and the dose rate. The ratio between dose equivalent and absorbed dose is called the quality factor or Q. The authors of NCRP Report No. 98, recommend using Q = 2.9 for the lunar radiation environment, excluding Solar Energetic Particle events. Consquently, a dose rate of 1 millirad/hr translates to 2.1 rem/month. For comparison, the annual maximum exposure allowed for radiation workers in the U.S. is 5 rem/yr. Properly designed shielding could signficantly reduce the dose rate and allow longer stays without significant long-term health risks. See Simonsen and Nealy for an analysis of shielding requirements. SEP events represent the major radiation risk to humans working on the Moon. The skin dose equivalent for the 1972 event has been estimated at 600 rem (NCRP Report No. 98, p. 48) and would be a signficant risk to anyone on the lunar surface without prompt access to shelter. An important factor in assessing risks from SEPs is the frequency of events large enough to be a hazard to unprotected people on the lunar surface. Notionally, an event with the same relative distribution of particle energies but with a fluence ten times smaller than the 1972 event would give a dose equivalent of about 13 rem to the blood-forming organs. For such an event, a crew out on an extended exploration traverse might be able to "ride out the storm" inside an adequately-shielded Rover cabin or, as Apollo 17 astronaut Jack Schmitt has suggested, even under the vehicle. Simonsen and Nealy also address shielding requirements for SEPs. Fluences (time integrated fluxes) from SEP events in the period 1955 to 2007. This figure is an expansion of Figure 3.16 in the Lunar Sourcebook and has been provided by R.C. Reedy. 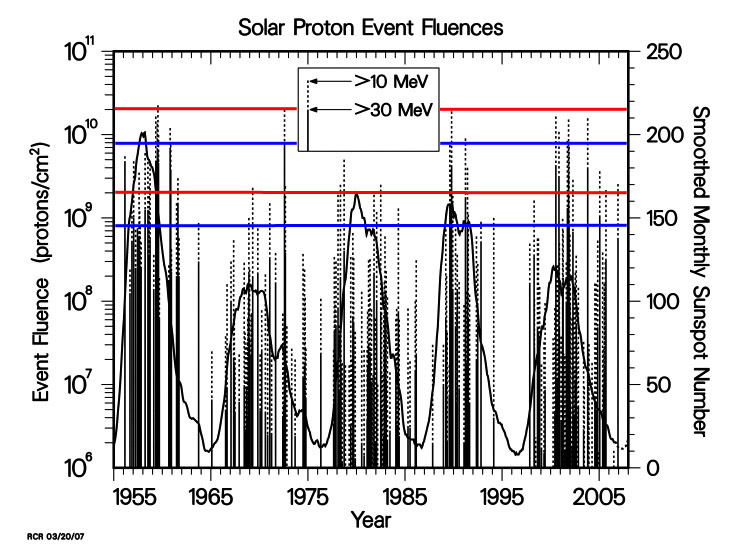 The upper red line has been added to indicate the fluence of protons from the August 1972 event more energetic than 10 MeV and the upper blue line indicates the fluence from that event above 30 MeV. The lower pair of lines indicate fluences a factor of ten smaller than those of the August 1972 event. 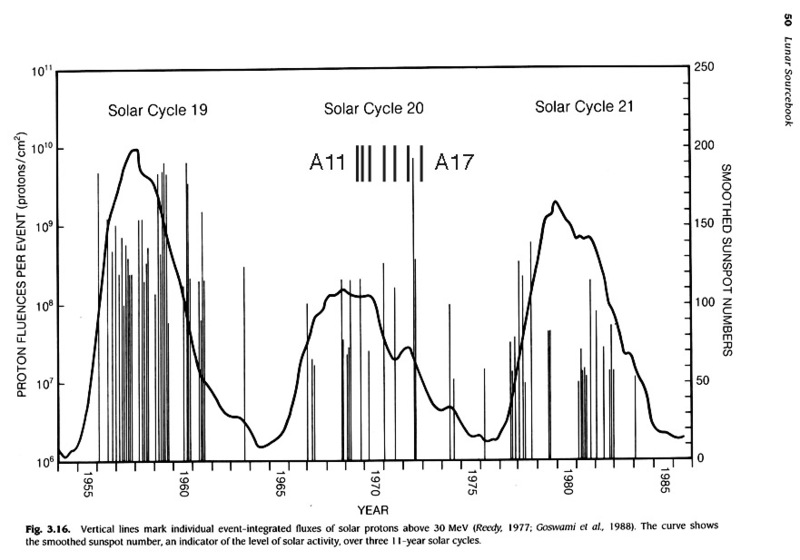 Roughly, over the five solar cycles from 1955 to 2006, there have been six events per cycle with fluences at 10MeV or more that were greater than one tenth that of the 1972 event and six per cycle at 30 MeV or more. Consequently, although there have been, on average, only one event per cycle comparable in size to the 1972 event, there have been about five events per cycle that were at least one-tenth that size. How typical are these event numbers of longer periods of time? Has the last half century been unusally quiet? Reedy ("Constraints on Solar Particle Events from Comparison of Recent Events and Million-Year Averages", 1996) notes that the surfaces of lunar rock samples that were exposed to space at the time they were collected contain radionuclides created by energetic solar protons. The activity of these readionuclides can be used to estimate the frequency of events much larger than those for which we have data. The results suggest that the average flux of energetic proton for the recent solar cycles is consistent with those estimated for the longer time periods and that events signficantly larger than the largest of the recent cycles have been "very rare or non-existent during the last (ten million) years".